The 49ers informed Garcon on Thursday that they won't exercise his $6 million team option for 2019, allowing him to become a free agent in March, Mike Garafolo of NFL Network reports. Analysis: The transaction only clears $1.53 million in cap space for the 49ers, but that provided enough of a benefit for the team to part ways with an aging wideout who missed 16 of 32 games due to injury during his two seasons in San Francisco. Set to turn 33 years old in August, Garcon most likely will have to settle for a one-year deal on the open market and probably won't be counted on to fill much more than a depth role with his next team. The 49ers aren't expected to exercise the team option on Garcon's (knee) contract for the 2019 season, Matt Maiocco of NBC Sports Bay Area reports. Analysis: Garcon has had an injury-laden two years with the 49ers, residing on injured reserve both times for significant stretches. In 2018, a knee injury was to blame, and the 32-year-old managed to haul in just 24 of his 46 targets for 286 yards and one touchdown in eight games. Considering his age and the potential hit to the team's salary cap for the upcoming campaign ($6 million), Garcon is a good bet to join the free-agent market before the new league year kicks off March 13. Coach Kyle Shanahan said Wednesday that Garcon (knee) isn't expected to return to the 49ers for the 2019 season, Matt Maiocco of NBC Sports Bay Area reports. Garcon will undergo season-ending arthroscopic knee surgery and be placed on injured reserve this week, Matt Maiocco of NBC Sports Bay Area reports. Analysis: For the second time in as many campaigns with the 49ers, Garcon is landing on IR, ensuring his least productive year (24-286-1) since he was a rookie in 2008. Overall, he accounted for 64 catches (on 113 targets) for 786 yards and one touchdown in 16 games while working with an array of quarterbacks in San Francisco. While Garcon is under contract through the 2021 season, the 32-year-old wide receiver could be a roster casualty in the offseason as a means to free up cap space. 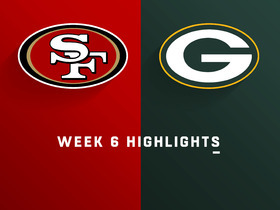 The 49ers ruled Garcon (knee) out for Sunday's contest versus the Broncos, Nick Wagoner of ESPN.com reports. Analysis: Garcon hasn't demonstrated an ability to get healthy for the better part of two months. The knee injury will keep him on the sideline Sunday for the fifth time in six games. With Marquise Goodwin back from his personal issue, the 49ers' receiving corps will be nearly intact Sunday. Behind Goodwin, expect Dante Pettis and Kendrick Bourne to continue seeing significant snap counts in Garcon's absence. Garcon (knee) didn't practice Thursday, Matt Barrows of The Athletic reports. Analysis: Perhaps Garcon was taking a test run of his knee with his limited showing at Wednesday's practice, but his downgrade to no participation Thursday isn't a good sign that a return is possible Sunday against the Broncos. If he's ruled out on Friday's injury report, it would mark his fifth absence in six games. In such a scenario, Marquise Goodwin and Dante Pettis would serve as the top wide receivers for Nick Mullens versus Denver's 23rd-ranked pass defense (260.8 yards per game). Garcon (knee) wasn't on the field for the media-access portion of Thursday's practice, Matt Barrows of The Athletic reports. Garcon (knee) practiced in a limited fashion Wednesday, Cam Inman of The San Jose Mercury News reports. Garcon (knee) has been ruled out for Sunday's game in Seattle, Nick Wagoner of ESPN.com reports. Analysis: With Garcon and Marquise Goodwin (personal) both missing another game, the 49ers will continue to rely on Dante Pettis, Kendrick Bourne and Richie James at wide receiver. Garcon at least managed limited practice participation this week, suggesting he could be back for a Dec. 9 game against the Broncos. Garcon (knee) was a limited practice participant Thursday, Nick Wagoner of ESPN.com reports. Analysis: While he's maintained his activity level in both practices this week, Garcon may be building toward his first game action since Nov. 1. He has one more session to fit in every rep, at which point his availability will be included on the 49ers' final Week 13 injury report. In a receiving corps with another question mark in Marquise Goodwin (personal), the trio of Dante Pettis, Kendrick Bourne and Richie James could be Nick Mullens' primary options yet again Sunday at Seattle. Garcon (knee) practiced in a limited capacity Wednesday, Cam Inman of The San Jose Mercury News reports. Garcon (knee) has been ruled out for Sunday's game in Tampa Bay, Nick Wagoner of ESPN.com reports. Analysis: Garcon didn't play in Weeks 8 and 10 and still isn't ready to practice or play after a Week 11 bye. Kendrick Bourne started both of the games Garcon missed, catching 11 of 16 targets for 104 yards in those two contests. Dante Pettis and Richie James are also candidates to handle some of the vacated snaps. Garcon (knee) was held out of practice Thursday, Matt Maiocco of NBC Sports Bay Area reports. Analysis: With back-to-back absences on the heels of the 49ers' Week 11 bye, Garcon isn't setting himself up to be active for the first time since Week 9. If Garcon is sidelined yet again Sunday at Tampa Bay, Kendrick Bourne likely would earn his third start of the season. Garcon (knee) didn't practice Wednesday, Eric Branch of the San Francisco Chronicle reports. Analysis: Unable to resume practicing after a Week 11 bye, Garcon is in danger of missing another game when the 49ers travel to Tampa Bay this weekend. Kendrick Bourne and Dante Pettis drew six targets apiece while filling in for Garcon during the 49ers' Week 10 loss to the Giants. Garcon (knee) is not present at Monday's practice, Cam Inman of The San Jose Mercury News reports. Analysis: Garcon is expected to practice at some point this week after missing two of San Francisco's last three games with an unspecified knee injury. However, his return evidently will need to wait at least another day as neither Garcon or Marquise Goodwin (undisclosed) were spotted in the portion of practice available to the media. In their absences, Kendrick Bourne and Dante Pettis figure to get extended reps with the first-team offense. Coach Kyle Shanahan expects every player on the 53-man roster, including Garcon (knee), to practice after the 49ers' Week 11 bye, Jennifer Lee Chan of NBC Sports Bay Area reports. Analysis: The 49ers' next game is Nov. 25 in Tampa Bay, so Shanahan won't be cobbling together another injury report until Wednesday, Nov. 21. At that point, Garcon's activity level will forecast his odds to play for just the second time since Oct. 21. If he returns Week 12, his presence likely would push Dante Pettis down the pecking order, with Marquise Goodwin and Kendrick Bourne the other San Francisco wideouts to receive significant workloads. Garcon (knee) has been ruled out for Monday's game against the Giants, Eric Branch of the San Francisco Chronicle reports. Analysis: Garcon didn't practice all week, so this designation shouldn't come as much of a surprise. Look for some combination of Kendrick Bourne, Dante Pettis and Trent Taylor to fill in for the veteran wide receiver with Marquise Goodwin serving as the clear No. 1 option at the position. Garcon (knee) did not practice Saturday, Matt Barrows of The Athletic reports. Analysis: Garcon's official status will likely be released later Saturday, but consider the veteran receiver questionable at best for Monday's game after failing to practice at all this week. Should Garcon miss any time, Kendrick Bourne, Richie James, Dante Pettis and Trent Taylor would compete for the extra snaps. Garcon (knee) didn't practice Friday. 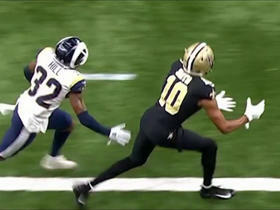 Analysis: Banged up for most of the season, Garcon finally broke through with a 3-56-1 receiving line in last Thursday's blowout win over the Raiders. An absence Monday night against the Giants would free up snaps for some combination of Kendrick Bourne, Richie James, Dante Pettis and Trent Taylor. Garcon (knee) didn't take part in practice Thursday, Matt Barrows of The Athletic reports. Analysis: On the heels of a three-catch, 56-yard, one-touchdown performance last Thursday versus the Raiders, Garcon continues to tend to a knee injury, which forced an absence Week 8. Considering this last fact, his status should be monitored closely to learn if he'll be available to the 49ers offense Monday against the Giants. Garcon (undisclosed) wasn't present at practice Thursday, Nick Wagoner of ESPN.com reports. 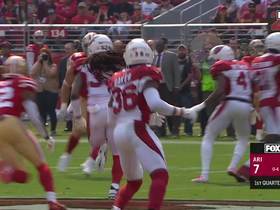 Analysis: The 49ers held Garcon out Week 8 in Arizona due to a combination of knee and shoulder injuries, but the cause of Thursday's absence is unknown. Coming off his most productive game of the season with third-stringer Nick Mullens under center -- three catches for 56 yards and a touchdown last Thursday against the Raiders -- Garcon will be a safety net for Mullens as long as he's healthy. 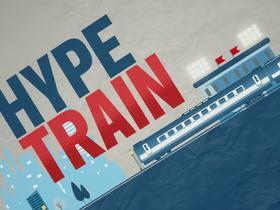 Consequently, Garcon's status is worth watching as Monday's game versus the Giants approaches. Garcon (shoulder/knee) brought in three of five targets for 56 yards and a touchdown in the 49ers' 34-3 win over the Raiders on Thursday. Garcon (shoulder/knee) is active for Thursday's game against the Raiders. Garcon (shoulder/knee) is listed as questionable for Thursday's game against the Raiders. Analysis: The 49ers only held two walk-throughs this week and both times Garcon was given a limited tag. He followed a similar practice regimen before his last game Week 7, when he turned a single target into five yards. If he's active Thursday, Garcon will seek a more fruitful outcome against an Oakland defense that has given up 8.9 yards per target and nine touchdowns to wide receivers this season. Garcon (shoulder/knee) was listed as a limited participant on the 49ers' estimated injury report Tuesday, Nick Wagoner of ESPN.com reports. Analysis: Garcon graduated from a non-participant Monday, but the team went through another walkthrough so he wasn't fully tested. The 32-year-old was the subject of trade rumors recently, but the 49ers allowed Tuesday's deadline to pass without making a move. Garcon was inactive for Sunday's loss at Arizona but is trending in the right direction for Thursday's game against Oakland. Garcon (shoulder/knee) was listed as a non-participant on the 49ers' estimated injury report Monday, Matt Maiocco of NBC Sports Bay Area reports. Analysis: A topic of trade proposals in advance of Tuesday's deadline, Garcon continues to deal with injuries to his shoulder and knee, which sidelined him Sunday at Arizona and threaten his status for Thursday's game versus the Raiders. 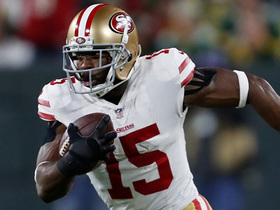 If he's held out again, the 49ers will trot out Marquise Goodwin and Kendrick Bourne as the top options at wide receiver. The 49ers have fielded calls from at least three teams this week interested in acquiring Garcon (knee), who has been ruled out for Sunday's game against the Cardinals, Adam Schefter of ESPN reports. Garcon (knee/shoulder) was downgraded from doubtful to out for Sunday's game against the Cardinals, Cam Inman of The San Jose Mercury News reports. Analysis: Garcon didn't practice this week so this isn't surprising, especially after coach Kyle Shanahan announced Wednesday that he was unlikely to play Week 8. The 49ers have a short week to follow as they face the Raiders next Thursday, making the possibility of a two-game absence a real concern. Dante Pettis and Kendrick Bourne should see increased snaps Sunday in his absence. Garcon (knee/shoudler) is listed as doubtful for Sunday's game at Arizona, Darren Urban of the Cardinals' official site reports. Analysis: Garcon didn't practice at all this week and has never been expected to play. His likely absence should free up playing time for Kendrick Bourne and Dante Pettis, the latter of whom has been cleared to return from a knee injury. Coach Kyle Shanahan said Garcon (knee) appears doubtful for the 49ers' Week 8 game at Arizona, Eric Branch of the San Francisco Chronicle reports. Garcon (shoulder/knee) hauled in his lone target for five yards in a 39-10 loss to the Rams on Sunday. 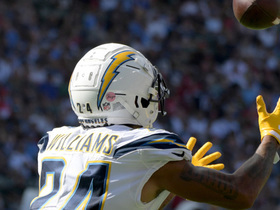 Analysis: It was an ugly day for all San Francisco wideouts, none of which recorded more than two catches against a tough Rams defense. Garcon could be more involved next week against the Cardinals if Marquise Goodwin draws shutdown corner Patrick Peterson in coverage. The veteran saw 13 targets (five receptions for 47 yards) the last time these two teams met back in Week 5. Still, Garcon's upside remains limited. Garcon (shoulder/knee) is active for Sunday's game against the Rams. Analysis: Garcon's practice time was limited this week, but he experienced no major setbacks with either his shoulder or knee coming out of the Week 6 loss to the Packers. The wideout was listed as questionable ahead of that contest, too, so it's possible Garcon may remain a regular on the injury reports without being in any serious jeopardy of missing game action. Garcon has hauled in 20 of 40 targets for 225 yards through six games, but he's yet to find the end zone. Garcon (shoulder/knee), who is listed as questionable for Sunday's game against the Rams, is expected to play, Ian Rapoport of NFL Network reports. Garcon (shoulder) is listed as questionable for Sunday's game against the Rams, Nick Wagoner of ESPN.com reports. Analysis: Garcon carries the injury designation into the weekend after he only managed limited participation in practices Thursday and Friday. The wideout has failed to record more than five receptions or accrue more than 57 receiving yards in any of his six outings this season. Even if he shakes off the injury and suits up Sunday, Garcon's fantasy upside will remain fairly limited. Garcon (shoulder/knee) practiced in a limited fashion Thursday, Nick Wagoner of ESPN.com reports. Analysis: With an appearance in practice earlier than last week, Garcon seems to be getting healthier, which can only help his production considering he's been targeted 26 times in C.J. Beathard's three starts. As evidence, Garcon has mustered 10.5 YPC and 5.2 YPT during that stretch. Assuming he takes the field Sunday, per usual, he'll be facing a Rams defense that has conceded 213 receiving yards per game and 10 touchdowns to wideouts over the last four contests. Garcon (shoulder/knee) was listed as a non-participant on Wednesday's estimated injury report, Matt Barrows of The Athletic reports. Analysis: The 49ers placed a cap on Garcon's practice reps last week, holding him out Thursday and Friday before allowing a limited showing Saturday. Kept on the 46-man gameday roster Monday at Green Bay, he earned the second-most offensive snaps (45 of 57) among 49ers wide receivers behind only Marquise Goodwin (54). Garcon's production hasn't been inspiring -- he's surpassed 50 yards twice in six games -- but his workload raises the chances of the occasional outburst. Garcon (shoulder/knee) caught four passes (six targets) for 37 yards in Monday's 33-30 loss to Green Bay. Analysis: Garcon suited up after nursing a couple of minor injuries during the week. The veteran recorded the same number of receptions as fellow starter Marquise Goodwin, but the latter turned in the stronger fantasy day (four catches for 126 yards and two touchdowns). Garcon is averaging 3.3 receptions and 37.5 yards per game with no touchdowns through six weeks, limiting his fantasy value despite his status as a starting wideout. Analysis: Garcon initially injured his shoulder Week 5 against the Cardinals and has since picked up a knee issue, per injury reports in advance of Monday's game. The preceding kept him out of practice until Saturday, when he logged a limited session. Now that he's been deemed active, he'll look to touch up a Packers defense that has given up 7.3 YPT and six touchdowns to wide receivers this season. Garcon (shoulder) is expected to play Monday against the Packers, Adam Schefter of ESPN reports. Analysis: Nothing had been reported about Garcon's Week 6 status since Niners released their final injury report of the week Saturday, but this report provides reason to believe he will take the field Monday night. The Packers defense has been a bit hit-or-miss against opposing wide receivers this season, but the unit does rank fifth in the league in passing yards against heading into Monday's game. Garcon (shoulder/knee) is listed as questionable for Monday's game against the Packers, Cam Inman of The San Jose Mercury News reports. Analysis: Garcon didn't practice Thursday and Friday but was able to put in a limited session Saturday to earn the questionable tag. The 32-year-old suffered the injuries in last Sunday's loss to the Cardinals and his status remains up in the air. Fellow receivers Trent Taylor (back) and Dante Pettis (knee) are listed as doubtful and ruled out, respectively, so the 49ers can ill afford to be without Garcon. Garcon (shoulder) isn't practicing Friday, Cam Inman of The San Jose Mercury News reports. Analysis: With Garcon and Trent Taylor (back) yet to practice this week, the 49ers may need regular snaps from Kendrick Bourne in Monday's game against Green Bay. The team might also turn to Victor Bolden or Richie James, but it's hard to envision either making much of an impact unless Garcon and Taylor both sit out. Dante Pettis (knee) has already been ruled out. Coach Kyle Shanahan relayed that Garcon would be withheld from Thursday's practice with shoulder and knee injuries, Cam Inman of The San Jose Mercury News reports. Analysis: It was known that Garcon hurt his shoulder early in the Week 5 loss to the Cardinals, but it's more surprising to see the wideout also listed with a knee issue. While it's possible that Garcon's absence was mostly maintenance-related, he'll need to put in a full practice by Saturday in order to avoid an injury designation heading into the Monday night matchup with the Packers. Garcon (shoulder) returned to Sunday's game, Matt Maiocco of NBC Sports reports. Analysis: Garcon left the contest after going to the ground in the first quarter, but he was able to return before halftime. With Dante Pettis (knee) and Marquise Goodwin (hamstring) both inactive, losing Garcon would have made the 49ers extremely thin at wide receiver. Garcon is questionable to return to Sunday's game against the Cardinals due to a shoulder injury, Matt Maiocco of NBC Sports Bay Area reports. Analysis: Garcon made an effort corral a low throw from C.J. Beathard in the first quarter and subsequently went to the bench in apparent pain. The medical staff examined his shoulder before escorting him to the locker room. If he eventually joins Marquise Goodwin (hamstring/quadriceps - inactive) and Dante Pettis (knee - inactive) as unavailable Sunday, the 49ers will be left with Trent Taylor, Kendrick Bourne, Richie James and Victor Bolden at wide receiver. Garcon had four catches (seven targets) for 52 yards in Sunday's loss to San Diego. Analysis: Garcon rebounded from a disappointing one-catch performance last week, pacing all San Francisco wideouts in receptions, targets and yards. Still, his final stat line left much to be desired from a fantasy standpoint. Garcon should be considered a low-end option in PPR formats against the Cardinals next week. Garcon gained 11 yards on his lone reception (four targets) in Sunday's 38-27 loss to Kansas City. Analysis: Garcon received just as many targets as fellow starter Marquise Goodwin, but did significantly less with his opportunities. The veteran wideout is averaging just 4.7 targets through three games after averaging 8.4 per game last season. George Kittle's emergence as a legitimate receiving threat coupled with Goodwin's improvement has limited Garcon's ceiling, especially if Jimmy Garoppolo (knee) is forced to miss extended time. Garcon caught all four of his targets for 57 yards during Sunday's 30-27 win over the Lions. Garcon caught two of his six targets for 21 yards in Sunday's 24-16 loss to Minnesota. Garcon caught two of three targets for 62 yards during Saturday's 23-17 preseason loss to the Colts. Garcon started Thursday's preseason win over the Cowboys, but he did not receive a target in the lone offensive drive for the first unit. Garcon (neck) has been healthy all spring, giving him plenty of time to build chemistry with Jimmy Garoppolo, Keiana Martin of the 49ers' official website reports. Analysis: Garcon suffered a non-displaced neck fracture Week 8 last season and missed the rest of the campaign. 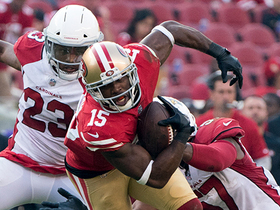 Marquise Goodwin (back) took advantage of the opportunity to emerge as San Francisco's No. 1 receiver, earning a three-year, $19.25 million extension in March. The 31-year-old Garcon is still locked in as the other starter, and it won't come as any surprise if he ends up leading the team in targets. He drew 67 in eight games last season, with Goodwin seeing 46 over the same stretch. 49ers coach Kyle Shanahan expects Garcon (neck) to come back healthy, Matt Maiocco of NBC Sports Bay Area reports. 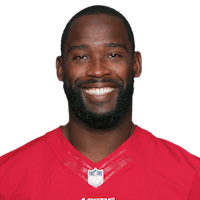 Garcon (neck) is expected to be ready for the start of the 49ers' offseason program in mid-April, Matt Maiocco of NBC Sports Bay Area reports. The 49ers placed Garcon (neck) on injured reserve Saturday. According to general manager John Lynch, Garcon (neck) is being placed on injured reserve, Adam Schefter of ESPN reports. Garcon (neck) isn't practicing Wednesday, Matt Barrows of The Sacramento Bee reports. 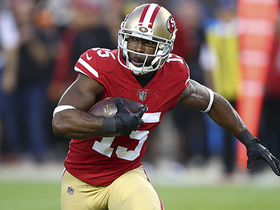 San Francisco 49ers wide receiver Pierre Garcon finds gap on cut across the middle. 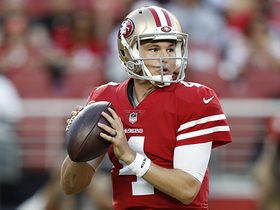 San Francisco 49ers quarterback Nick Mullens finishes perfect opening drive with touchdown to wide receiver Pierre Garcon. 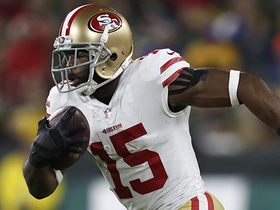 NFL Network Insider Ian Rapoport brings the latest information on the potential trade value of 49ers wide receiver Pierre Garcon. San Francisco 49ers wide receiver Pierre Garcon turns pass behind the line of scrimmage into an 18-yard gain. San Francisco 49ers wide receiver Pierre Garçon makes a fantastic catch for 20 yards and a first down.